Argentina open their 2018 World Cup campaign against Iceland, and the Albiceleste is red hot favourite to beat the Icelanders. Fancy Argentina to make a winning start? Get a 25/1 price boost at Betfair, plus a welcome bonus of £100! Will Messi & co. claim all three points and take a commanding lead in the World Cup Group D? You have a great chance to make a £25 net profit by staking £1 on the South Americans to beat Iceland! 25/1 Argentina to beat Iceland with Betfair! 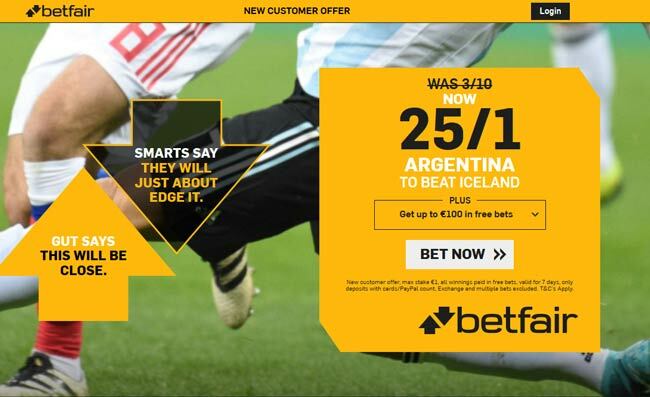 Get 25/1 Argentina to win vs Iceland with Betfair! Register a new account with Betfair before the kick-off and claim 25/1 Argentina to win their 2018 World Cup match against Iceland - A tasty price boost! If Argentina get all three points, Betfair will pay out at the quoted price immediately. They will top up your additional winnings within 24hrs. Get 25/1 Argentina to beat Iceland with Paddy Power! New Customers can get Argentina at an enhanced 25/1 to beat Iceland. Max Stake £1. Winnings paid in free bets, valid for 7 days, only deposits with cards/Paypal count. Exchange and multiple bets excluded. T&C’s Apply. 18+|Gamble Aware. 70/1 World Cup enhanced acca! Ladbrokes offer 70/1 for France, Argentina, Denmark and Croatia all to win + £5 free bet! 33/1 Messi to score vs Iceland! Coral offer 33/1 Messi anytime goalscorer against Iceland + £5 free bet! 4/1 Argentina or 100/1 Iceland to win! 888sport offer 4/1 Argentina or 100/1 Iceland to win! Max bet £5! Argentina boast the most powerful attack of the tournament with Messi, Higuain, Aguero, Dybala and Di Maria. Iceland's form has not been very impressive as their last win came five matches ago against Indonesia. Heimir Hallgrimsson’s side conceded as many as 11 goals during the thread of three defeats and a draw in last four friendly internationals. The best price on Argentina to win is 3/10, but you can grab this amazing 25/1 by joining Betfair through this page! Betfair are offering all new customers registering through this page a massive price of 25/1 Argentina to beat Iceland, click here to get your insane price boost in few simple steps! "Get 25/1 Argentina to beat Iceland at Betfair (World Cup price boost)"